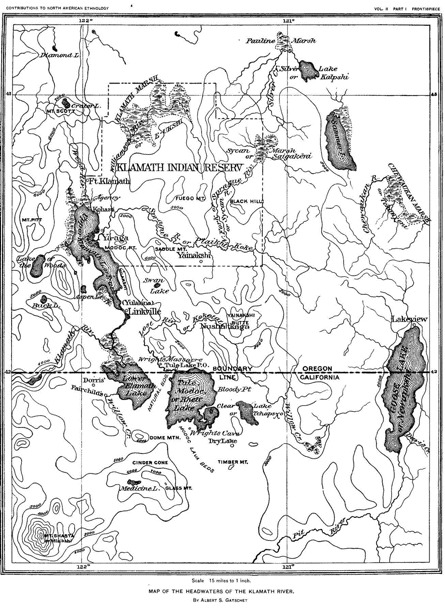 This 1890 map was first published as the frontispiece in Albert Samuel Gatschet's study, The Klamath Indians of Southwestern Oregon. It covers the traditional homelands of the Klamath and Modoc Indians, extending a bit south into Pit River country. Linkville is an early (and short-lived) name for Klamath Falls, and Yulalona is the old Klamath name. Notice three names for Tule Lake, and right in middle of this landscape of magical and provocative names is the Tule Lake P.O.